I got started in bridge during early university days in the mid 1960’s; I think it was a Woman’s Weekly article that provided the impetus. Early bridge mentors were mother, Don Evans and Roelof Smilde. But having landed a lectureship in the Maths Department at Sydney University in 1974, bridge took a second seat to my academic career. During that time I was very instrumental in the development of the Sydney University Bridge Club where I helped to nurture many fine young players. The following names, from that time, may ring a bell or three: Warren Lazer, Bob Sebesfi, Fred and Anita Curtis, Peter Gill, Matthew Thomson, John Roberts, David Beauchamp, Jodi Tutty, Kim Neale, Kylie Robb and Peter Newman to name those who stick in my memory. Professionally I am a University Medalist in Applied Mathematics, have a PhD from Cambridge University (same department as Stephen Hawking) and retired from the Maths and Finance Departments at Sydney University as an Associate Professor in 2010. I still hold an honorary position in the Finance Department. My book An Introduction to Exotic Option Pricing has now sold almost 100 copies! Current interests include hiking (all over the world and still doing it), golf, cruising, mathematical puzzles (I am a cubist of the Rubiks’ kind), reading, grand-kids and like many other bridge players I am a DA-tragic cruciverbalist. I never really played that much bridge during my working life and even today I rarely play more than once a week, but since retirement I do try and attend most of the big national events. 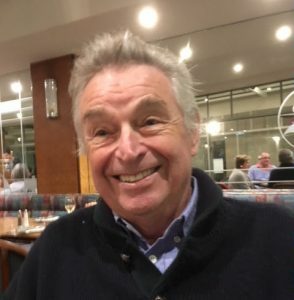 I foster long term partnerships and apart from some minor excursions, have had only five partners to speak of in more than forty years of bridge (viz Fred Curtis, Peter Fordham, Bobby Evans, Henry Christie and Terry Brown). I find bridge both challenging and stimulating and never cease to marvel at the myriad of permutations and combinations that appear at the table and how the smallest detail can leads to the such amazingly diﬀerent outcomes. I like to think of bridge as a “two-person game, where each person consists of two people”. My most memorable and enjoyable victory in bridge was winning the Victor Champion Cup with my wife Kathy (and fellow wife-husband pair Cathryn Herden and Matthew Thomson) in 2015. I like to boast that I am married to an Australian bridge champion. I was on the WBF Scoring Panel which introduced the new continuous Victory Point scales in 2013. The inclusion of two decimal points in the scales was initially greeted with horror and outrage. But some five years on, most players around the world seem to have accepted the new scales as a definite improvement. I have also had some technical input into the recent spate of cheating allegations, by assisting the European Bridge Union (EBU) in their prosecutions against a number of high-profile players. My role was solely in the mathematical area. In the light of the outcomes, suﬃce to say that “mathematically” guilty and “legally” guilty are two completely diﬀerent beasts. 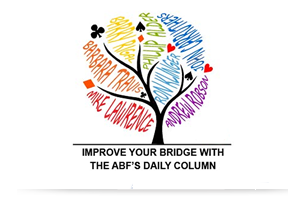 Favourite deal: the one below featuring a double-backward (aka double-transfer) finesse, an invention of mine which was published in the April 2014 issue of the Bridge Bulletin of the ACBL. After West leads the ♣J, East takes the Ace and plays three rounds of Spades. Leave it to you to figure out the rest, but it involves Declarer first testing Diamonds then leading the ♥J for a finesse against East, then the ♥9 for a second finesse against West and finally leading the ♥7 for a third finesse (of the ruﬃng kind) against East again – all to establish the ♥4! Another curiosity occurred at the table in the final of the Asia Cup between Australia and Indonesia (Seniors) in 2014. I was sitting West defending their hopeless contract of 4♠and we were down to the last three tricks with me on lead and declarer already two down. I realised that playing a Club would allow Declarer to ruﬀ and I would only score the trump Ace. So I led the ♠A and Declarer found himself in a quandary no-one seems to have seen before. If he played low from dummy, the next Spade would be won in dummy by force and they would find themselves with a Club loser. So Declarer unblocked the ♠K under the Ace, but now the ♣8 forced Declarer to ruﬀ with the ♠Q and my ♠J won the last trick for four down. I named this position the monarch squeeze because the position of the K and Q of trumps was critical to its success. Swap the K and Q and the ending just described fails to materialise. To date, I have won numerous NSW State titles and 31 National Australian titles including 13 Open and 18 Seniors, listed below. All representations below were with Australian Seniors Teams.